One of the main differences between full-time cruises and seasonal charters is that charters only run a few months of the year where scheduled cruises are a yearlong proposition. Currently there is no direct ferry service from Tampa to Key West, but there are companies that go from Fort Myers, just a two hour drive away. Some Western Caribbean cruises from Tampa like those offered by Holland America make their first port of call the lovely island chain known as Key West, as do Royal Caribbean who also stop at Cozumel. If you didn’t want to spend the money for a full cruise or wish to travel to any other destinations, then a seasonal charter would be the way to go, taking you solely to Key West. A cruise from Tampa to Key West takes you down along the coast of Florida and if you’re on Royal Caribbean’s 5 night trip, which cruises to the Cayman Islands and Cozumel you get the best of three ports instead of just one. The Carnival western Caribbean cruises don’t stop at Key West on their way to Cozumel, Grand Cayman, Belize, Mahogany Bay, or Costa Maya, but they do allow you to see many ports of call on one trip, which is something that attracts millions of cruisers a year to the high seas. If Key West is still a top destination for you, a cruise from Tampa to Key West with several different itineraries is available through Royal Caribbean or Holland America, and can last from 5 to thirteen nights including ports such as San Juan, the US Virgin Islands, Aruba, Cozumel and Haiti. Or alternatively you can book a seasonal charter to take you just to Key West and your vacation to the sun. 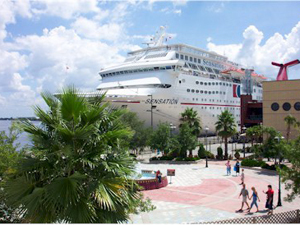 Cheap cruises from Tampa, FL are available no matter what choice you take, and booking early is always a good idea as that is where the deals can be had. A cruise from Tampa to Key West gives you the chance to see two distinct parts of the state in one easy trip, whether you travel with the big guys or a little boat with big personality.